Between the 9th and 10th of February, the Escola Europea has consolidated the TransLogMED and SailNet projects in Algeria by signing agreements with various significant national institutions of the logistics sectors. The Escola’s director, Eduard Rodés, met with the president of the national group of port services – Serport, Mr. Achour Djellol, to sign the collaborative document in the framework of the TransLogMED project. The project aims to promote the benefits of the Motorways of the Sea as tools for sustainable development and the creation of employment in the port logistics sectors in the Mediterranean region. 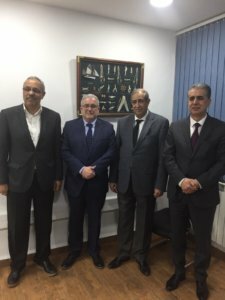 As part of the promotional visit, and to increase collaboration within the country, Mr Rodés visited Aouidette Djelloul, the president of the National Union of Freight Forwarders and Commissionaires of Algeria (Union Nationale des Transitaires et Commissionaires en douane agréés Algériens – UNTCA). The Escola has already held various activities in Algeria in relation to this project. Futhermore in 2019 a MOST (Motorways of the Sea Training) course dedicated exclusively to Algerian operators will take place. On the second day of the visit Eduard Rodés met with Abdallah Seriai, the president of the Professional Association of Algerian Maritime Agents (APAMA) and Aziz Mantrach, the president of Fonasba, the international federation of maritime agents, to formally incorporate Algeria in the SAILNET project, a programme nurturing education and international mobility established in seven countries (Spain, Portugal, Italy, Morocco, Tunisia, Argentina and now Algeria). The goal of this project is to establish a unique knowledge network through courses and exchange programmes for young professionals of the maritime and logistics sectors, therewith fostering potential future collaboration between companies in the participating countries. As part of the event, a presentation on the position of the cosignatory agent as interpreted by international law took place, followed by an introduction to the new agreements between FONASBA and BIMCO (the International Maritime and Baltic Council).